Today is the first in my series of guest posts while I am traveling with my husband and 16 college students in Europe. I'd like to introduce you to my first guest blogger: Danielle at A Day in the Life. Her blog focuses on her life as a mother, travel, crafts, and most of all...food! 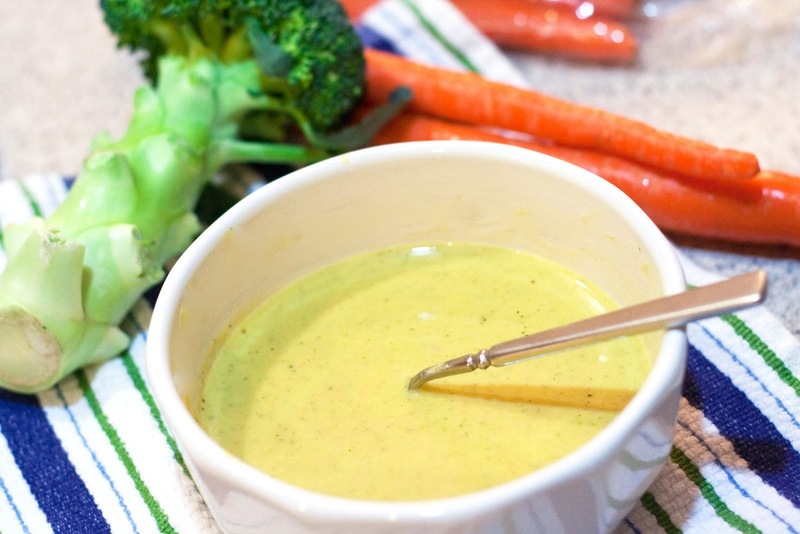 Go check her blog out and read on for her post about Broccoli Cheddar Soup! A few months ago, I posted about a group I had proudly become a part of, the Kentucky Food Bloggers. One of the creators of this group, Mindy, helped organize our first outing in conjunction with the Incredible Food Show and did an incredible job, I might add. When she asked for help filling in the blanks while she went overseas, I jumped at the opportunity to help! Perfect for the cold months ahead, Mindy decided to steer her guest posters in the direction of warm soups. There's nothing that sounds more enticing to me in the winter than a warm bowl of soup. I'm more of the wholesome, throw-as-many-vegetables-in-as-you-can type of soup lover but I try not to discriminate. One of my favorite food blogs is Annie's Eats because I've loved everything I've ever made from her site. Batting a thousand at any one site is practically unheard of for me, but with Annie I feel fairly confident that if she liked it, I will too. I have had her Broccoli Cheddar Soup bookmarked for quite some time, but because neither of my boys' young stomachs were able to tolerate broccoli, I haven’t had the chance to try it. Well, now that I have graduated from being their sole source of nourishment, I practically crave broccoli after going without it for so long. This was the perfect opportunity for me to get to try this recipe. This is such a wholesome and delicious soup! I enjoyed how you could taste so many various flavors in every bite. The broccoli was certainly present, as were the richness of the butter and the creaminess of the sharp cheddar. With broccoli having a rather pungent flavor, the sharpness of the cheese really helped to cut that and make it a very mild tasting soup. The only thing I might consider doing differently next time would be to let the cheese sauce get a little thicker, or add less chicken stock. In all fairness, I didn't actually measure the chicken stock before pouring it in, so I might have been a little heavy handed in my pouring. The flavor is so good though--it really doesn't matter what the consistency is, you'll still want to lick the bowl! I hope you enjoy and I hope you'll visit me at A Day in the Life. Happy and safe travels, Mindy! In a large stockpot or Dutch oven, melt 2 tablespoons of butter over medium heat. Add the onion to the pan and sauté until tender, about 5-7 minutes. Add the carrots to the pan and cook a couple minutes more. Stir in the broccoli, chicken broth, onion salt and garlic powder. Bring the mixture to a boil, then reduce the heat to a simmer. In a medium saucepan, melt remaining butter. Add the flour and cook for 1-2 minutes until golden brown, whisking constantly. Whisk in the milk and cook until the mixture thickens and bubbles, about 5 minutes. Once the mixture has thickened, whisk in the cheese until completely melted. Remove from the heat and add the cheese sauce to the soup pot. Allow to simmer until warmed through and broccoli is tender. Season with salt and freshly ground pepper to taste. If desired, puree the soup with an immersion blender for a smooth texture. Photo courtesy of the guest author. What a pleasant and flavourful soup! Pieces made with Europe usually are earth well known with regards to premium quality in addition to chanel replica delicate know how. Metropolis connected with Geneva would be the epicenter with the Switzerland check out doing deal. Geneva wristwatches usually are hugely sought after by means of gucci replica the entrepreneurs. America connected with Europe is usually wonderful with it is magnificence having piles in addition to clear seas in addition to revenues. Legitimate clock addicts will need to create metropolis connected with tag heuer replica Geneva on their directory sites to check out at least one time within a life-time. Intended for average folks, the coffee quality in addition to magnificence of any Geneva check out are often available for purchase on the net. Geneva incorporates a very long in addition to burberry replica loaded heritage from the clock small business although it is start out seemed to be dependant on some sort of suspend connected with bracelets using in addition to formation from the location around 500 in the past. These whose deal was a student in this goldsmith in addition to bracelets spot just weren't acceptable to help practice that livelihood in addition to desired to get a completely new deal. Out of this dior replica anti-jewelry edict ocurred a full completely new deal from the formation connected with wristwatches.